Eric's Review - In some ways, this is better than Leyline of Sanctity, but in other ways, Leyline is better. This is a 2/1 Enchantment creature for half the cost of Leyline. This can be removed by any enchantment or creature destruction and even -1/-1 counters or otherwise. It's still counted by Ethereal Armor and things that care about enchantments. Leyline is better because it can be played for free turn 0 and can only be removed by enchantment destruction. Bottom Line: This will fit in budget Modern Bogles decks and will likely see play in Standard either in any Bant Hexproof and/or White Weenies. Devin's Review - It is a great card for sideboard against any black deck in standard (Thoughtseize and devour flesh) and any burn deck . Being able to make direct burn impossible is great but it only waste one burn spell that would hurt you unless they only have player damage spells like Boros charm or Skullcrack. Eric's Review - This is a pretty good instant. 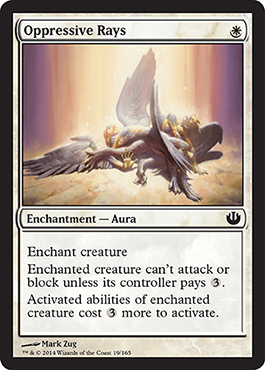 For just one white, you boost a creature and give it indestructible. What makes this even better is the ability to target more than one creature. Devin's Review - Most likely limited only but great for those already amazing heroic deck, and late game can just overwhelm your opponent with all the heroic triggers. On a side note one mana to make a creature indestructible isn't something to scoff at in limited or Standard. Eric's Review - At four mana for a 2/2 creature with the ability to tap another creature, this is definitely not on my list of cards to play, even in limited. 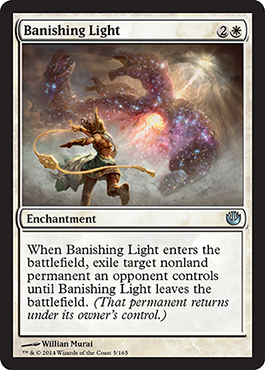 Bottom Line: There are a ton of better cards, especially in the current standard (like some Azorius cards from RTR). I would also choose most other cards over this in limited. The only upside to this card I can see is the cool art. Devin's Review - This card is a limited squeeze in that is if you really need to a 23rd member of you deck. It lacks the finesse that i wan't from a tap down creature and feels really slow. Eric's Review - This is a pretty good card, especially now that we have a lot of enchantment creatures flooding Standard. Of course, this won't work to well anywhere outside of Standard as I don't see enchantment creatures making too big of a splash outside of Standard. Bottom Line: Powerful in limited and Standard, potentially a powerful spell in EDH, but best when played with many enchantment creatures. Most likely best in a limited environment. Devin's Review - I love these two sided conditionals auras that is a bane to some and a boost to other. This aura is one of the better with being a huge boost to you enchantment creatures and pseudo-removal for you opponents big guys. This card really depends on the future meta on whether it sees standard play , if their is plenty of enchantment creatures in a white deck i would easily play this but that is the only way. Eric's Review - This is pretty much just an Oblivion Ring under a new name. The art is wonderful, and this will definitely see play. 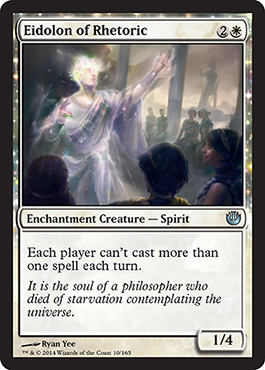 Bottom Line: Perfect for Standard, Modern, EDH, or any format that needs something exiled. Devin's Review - Yeah oblivion ring but with pretty art and a better name. This card will see huge play just like Oblivion Ring before it. Amazing in limited and happy to have it in the format. 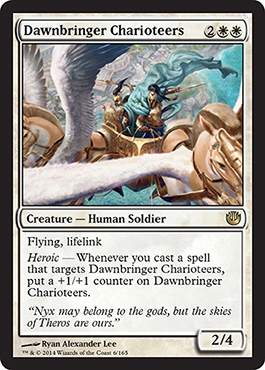 Eric's Review - If you can get a common that is 1/1 with lifelink for one mana, and a 1/1 with flying for two mana, then four mana for a 2/4 with flying and lifelink is pretty good, especially when Heroic is tacked on. Bottom Line: With all the spells to target creatures to trigger Heroic, I think this is a pretty good card and it's actually pretty playable in Standard. When you consider Intro Pack foils/Prerelease Promos don't have much playable value outside of limited, this one is the other way around. 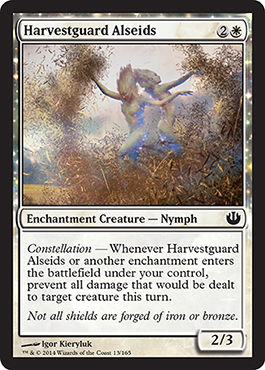 Devin's Review - Nice guy for heroes in limited and it is one of the best "Pillarfield Oxes" in magic, but this card will go nowhere in any serious constructed deck. Though one really good thing this card has going for it is that flavor. Eric's Review - This is a cheap cost to cast and it gets rid of all the annoying indestructible gods out there permanently for the game. Forget devotion decks that have the gods in them, this will end decks that run gods. Bottom Line: This is perfect. It is white enchantment destruction so it will already see play, but it gets rid of gods. I know I'm going to run this mainboard in my white weenies deck. Devin's Review - What isn't amazing about this card the art is beautiful, the flavor is fantastic, the flavor text is great, and the ability is amazing. So at it's base this card is Revoke Existent at instant speed which isn't that bad for side board but when you read the rest of the card is where it all changes. Being able to permanently "kill" a god and leave them godless is fantastic and will be a great hoser against Thassa or any other pesky god. Overall going to see play in plenty of white sideboards. Eric's Review - There are several enchantments or artifacts that give a boost to creatures, but those typically cost two or three mana and only give +1/+1 or specifically boost one color or tokens. With this enchantment, you get +2/+2 and you can play it on an opponent's turn in response to them attacking. 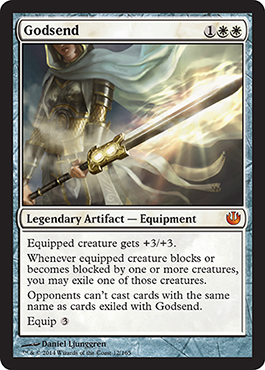 Bottom Line: It isn't bad and it can be good given that Spear of Heliod is Legendary. This is pretty costly especially when a game can be won in four or five turns in Standard without this, but it is cheaper than Elspeth, Sun's Champion and gives the boost her Emblem does (minus flying) without taking several turns to get there. 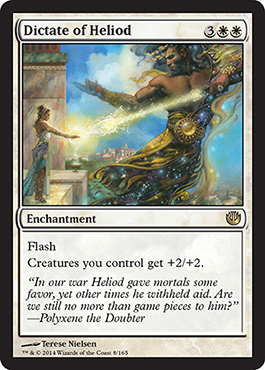 Devin's Review - Great in limited especially sealed were the format is slower and you can safely get to 5 mana to cast it, but when compared to it's competitors for standard (Spear of Heliod and Hall of Triumph) it just can't get there. The deck you would put this in wants to be killing you around turn five and you really don't want to be wasting a spot on something that may help you in the late game which is where white weanies does not want to be. Eric's Review - A bit expensive, but it is a common. Probably will get some play in limited, but it won't see play in Standard. Bottom Line: Great for limited and will actually make it into my pauper cube. Devin's Review - It is a bird! Eric's Review - This is something I would expect to see in a control deck. Or maybe anti-control. I'm just still on the fence about this given that it locks down anything you can do too. I can see how this would be good, but I can't see where this would be put. It might be more of a sideboard card to be honest. Bottom Line: It locks down everyone, not just your opponent, so it should probably be a sideboard card that locks down any fast opponent. Devin's Review - It's is a Rule of Law with a body though I just don't know what to think of this card in Standard it could be horrible it could be the second best uncommon in Journey into Nyx. It will really take time to tell if this card is good. Eric's Review - It's not bad, but it's not great either. The overall cost is five mana, while Angel's Mercy costs four mana. It does give you an enchantment until it gets sacrificed which could be a boost to Ethereal Armor until September/October 2014. Bottom Line: I find this showing up probably in budget decks, maybe lifegain decks, and I would probably expect this to show up in W/U or Esper Control. 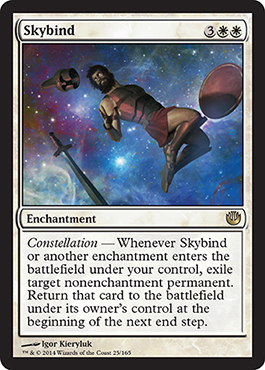 Devin's Review - It triggers constellation that is all i cna say for this card, i mean maybe a forced 23rd if you really need it but overall horrible in limited and don't even think about constructed. Eric's Review - This is really powerful. It will take a couple turns to cast and equip it, but the rewards are great. You get to exile creatures (exiling Mutavault will not keep it from being played. It isn't a spell so it isn't cast), and you get a +3/+3 boost to the equipped creature. Bottom Line: Honestly, this reminds me of Moonsilver Spear except this is slightly cheaper, but the overall cost is six mana. Will it see play? Probably. Will it be played for long? I actually doubt it. This will require mana ramping to be played effectively in Standard, however I think this might become a great EDH card. Like I said before for other cards, games can be won in four or five turns already. This would slow those decks down. Devin's Review - Like i needed another reason to play mono-white post RTR. Bomb in limited and playable Legacy and that is saying something, I also expect it to see standard play. Eric's Review - Seems nice, especially for the cost. This will also fit in well with the cycle of flash enchantments since you can protect a creature during an opponent's turn. Bottom Line: Limited for sure, but I'm not sure it will be used much in Standard. 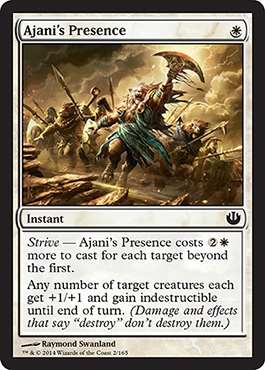 Devin's Review - White is liking to prevent damage from one card this set. I wouldn't play it in limited, but somebody might and for that person it may be good. Eric's Review - This is actually pretty good. It's a good play for a turn one as it will block pretty much anything, but it also has the ability to get a heroic trigger making it capable of fighting back and dealing damage. 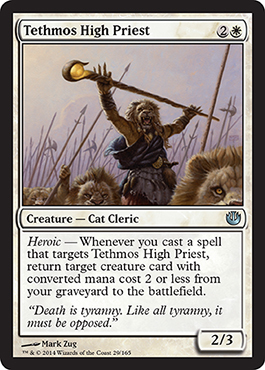 Bottom Line: Might see some play in Standard, but only in a white heroic deck. Otherwise all play will be strictly limited. Devin's Review - A heroic Yoked Ox, now this is good. Yoked Ox was able to fit in some white decks in limited but being able to have the same creature with heroic is just amazing, but no constructed play. Eric's Review - This is an extremely amazing card and I think this will go places. Presale is for $1.00 each from Star City Games. I'd personally advise getting a playset if you want to play White Weenies or do some sort of W/U deck with Battlefield Thaumaturge. Bottom Line: This is good. Buy it. Use it. 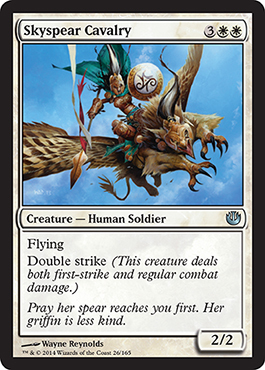 Devin's Review - Battlefield Thaumaturge is enough proof for me that this card is playable at your local FNM, it is part of a cute combo in standard but not much more than that. In limited like many of the strive cards great for W/x heroes. Eric's Review - My best opinion is a possible sideboarded card. It only destroys enchantment creatures when triggered, so it probably won't be played. Bottom Line: Better cards out there, limited formats if anything. Devin's Review - I don't like heroics that do something conditional, and this is no exception. 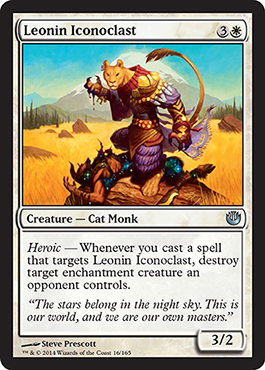 Maybe in limited but wouldn't pick it high in draft when there are some many better white heroic things in this set. 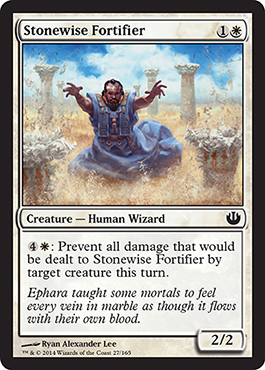 Eric's Review - Cheap enchantments what work well with Ethereal Armor are cool. 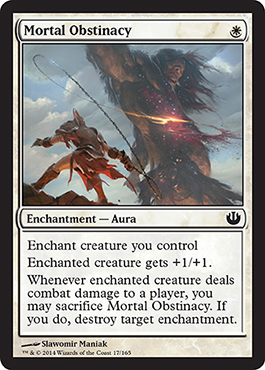 However, you also get to destroy enchantments if you deal combat damage to a player with this creature. Gods are indestructible so I'm not sure what the art is doing (and I don't recognize that god if it even is one). Bottom Line: Decent for any heroic deck with white or specifically white weenies. Devin's Review - It is heroic trigger that can kill an enchantment, that is about it. 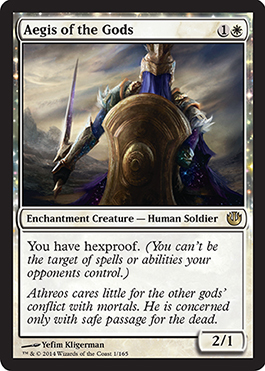 Eric's Review - Well look at that... yet another reason I need to bring out a lifegain deck using Archangel of Thune. This even works great in an Oloro EDH deck with other lifegain shenanigans. Until someone kills it, it's a great wall and you get life each turn. 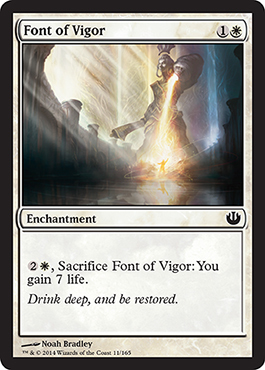 Bottom Line: Good for lifegain decks and good in some EDH decks. 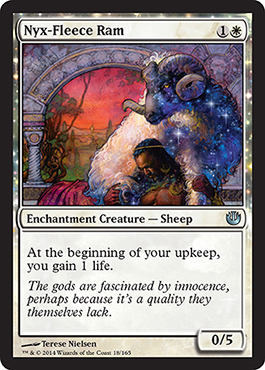 Devin's Review - IT IS A PLAYABLE SHEEP IN STANDARD! To be serious it is great for any white deck being able to eat almost any ground attack early game and gaining life every turn just puts this card over the top. Eric's Review - This is a relatively cheap Sphere of Safety, but works only for one creature. Good for Standard and I'd play it in White Weenies. Bottom Line: I'll definitely put it to use in a White Weenies deck. Devin's Review - It is a a Cage of hand that can only get one creature i like it in limited but that is about it. 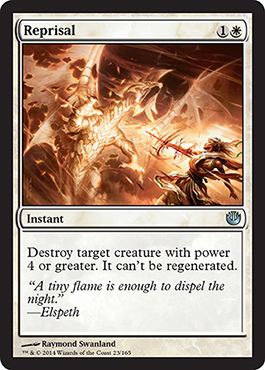 Eric's Review - Well, it's like the Spike Jester found in Rakdos decks, but it doesn't have haste and is just white. It falls easily, but hey, seems like it could be good, I guess. Bottom Line: Probably will be found in limited or just wind up in budget Standard decks. 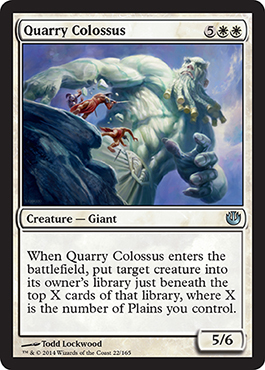 Devin's Review - a 2 mana 3/1 in white well that is interesting now i think i found a great 2 drop for white weanies. Decent in limited and has some possibility in standard. 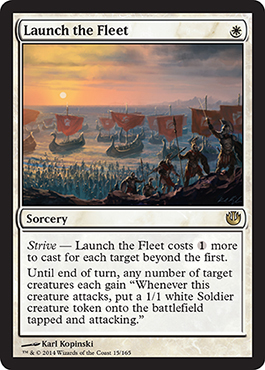 Eric's Review - Strive is wonderful for triggering Heroic, and giving creatures double strike is great. Definitely a great card and a relatively cheap Strive cost too. 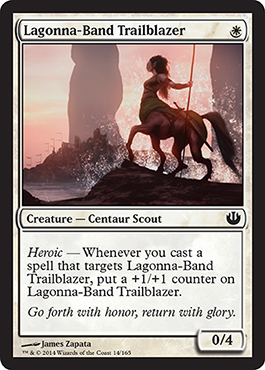 Bottom Line: Will likely see Standard play and is definitely great in limited. Devin's Review - Wait 3 mana to give a creature (hopefully one of those huge green creatures with heroic) double strike than being able to pay 2 mana to spread the love i like it for limited. Eric's Review - Anything that costs over five mana is a difficult thing to put in any deck outside of EDH and possible limited. Mana acceleration is one thing, but the text on this card says mono-colored to me. Bottom Line: Mono-colored EDH is where I would stick this. I don't even see this fitting in with a limited deck. Devin's Review - (Eric): I screwed up the post and managed to omit a couple cards when I turned this post over to Devin. 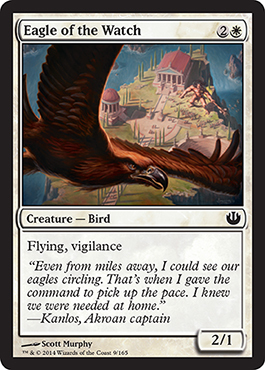 Eric's Review - Well, here we have a card that looks like Elspeth's -3 ability but targets one creature and not all of them. Seems pretty good. Bottom Line: White removal spells are always good, I think. I expect to see it in Standard. Eric's Review - Depends on what I'm doing as to whether or not I want to use this card. 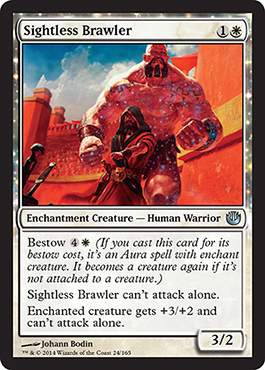 Bestow is too costly especially considering the downside, but it is a 3/2 or gives the enchanted creature +3/+2. Bottom Line: It isn't amazing, but it isn't bad either. 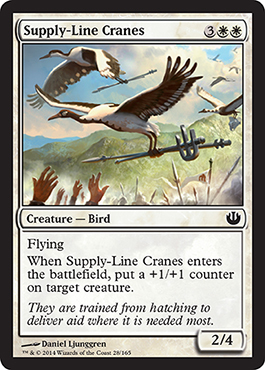 White Weenies could use this or a Boros Battalion deck could use this since you'll already have other creatures swinging with this. Devin's Review - This card oozes basic flavor, but aside from that not good wouldn't put it high on my pick list. Bottom Line: An EDH card if I ever saw one. Devin's Review - Blinking i like it Great EDH card but that is about it not enough really good ETB effects in standard. 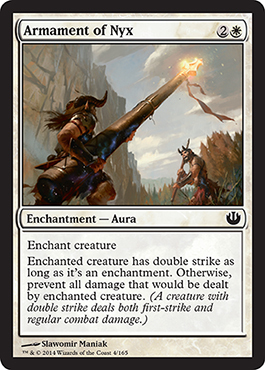 Eric's Review - For five mana, we have a flyer with double strike. And it's only 2/2. Maybe a limited card. Not much in the way of Standard. Bottom Line: Limited card, maybe EDH. Devin's Review - a flavorful flying double striker that i can't wait to pick up in draft or slam in sealed really like it. Eric's Review - Limited if I ever saw it. It's a stop-gap in Standard and its ability will not be used in Standard. Bottom Line: Great for limited, not so great for anything else. Devin's Review - a bear that can protect itself not bad not to bad at all. Eric's Review - It is interesting, for sure. I do not feel as if this will make it in Standard or otherwise. I do expect to see it in limited games, definitely. Bottom Line: Limited, EDH, possibly Standard, but not likely. Devin's Review - I like this practically a 3/5 that can spread some love not too bad in limited. Eric's Review - It actually seems not bad. I don't know how big a splash it will make in Standard, but I doubt it will make it too far. It is pretty good given that we have Strive. We'll just have to see what happens with it. Definitely something to look for in limited. Bottom Line: Limited, possibly Standard, likely to be found in EDH. 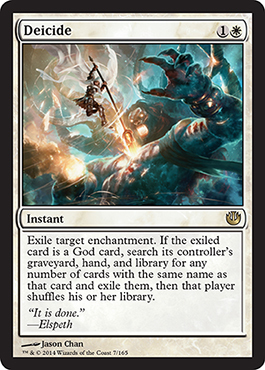 Devin's Review - If only it cost 2 instead of 3 then it would be a standard all star but in limited this is amazing being able to reanimate a guy in limited in white is amazing.